I am so excited to share this gorgeous blush wedding that took place at the Williamsburg Inn in Williamsburg VA. Two weeks in a row at the Inn in Williamsburg was such a fun experience and we are looking forward to many more weddings there in the future! Such a beautiful hotel and so close to home, we absolutely love the staff and love shooting there. I don’t know about you, but I love spring. Here in Virginia I think we have some of the prettiest seasons and Spring is definitely one of my favorites. My heart jumps for joy when I see the cherry blossoms blooming and the dogwoods showing off. 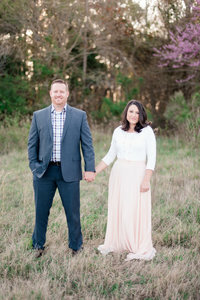 Couples who choose to get married here in the Spring sure do have lots of beautiful colors as their backdrop. I feel like Spring started to come quickly and then came to a halt. However, that is Virginia weather for you. You never know what your going to get! Colin and Lara lucked out because they got one of the prettiest Spring days we have seen! When we shot their engagement session up in DC, it was so cold and windy! I am so happy that for their wedding day we got the most gorgeous weather! Lara & Colin said their I Do’s in the heart of Williamsburg. Aligned with gorgeous florals from Karen at Aleen Floral Design, and surrounded by the beautiful history of Williamsburg Va, the couple married among their family and friends. Their beautiful ceremony was such a sweet moment to be apart of and Luke and I truly love that we are able to capture these sweet intimate moments that are the beginning of a lifetime. Lara was such a gorgeous bride and so calm and collective. I loved how she soaked in the day and partied on the dance floor! I don’t usually get to spend a lot of moments with the groom. I am usually with the bride the most of the time and Luke with guys. However, the timeline of the wedding allotted plenty of time before the ceremony, so I joined Luke a few times to help assist with guys. One moment was when Colin read his brides letter in the library at the Inn. While Colin read Lara’s letter quietly, silent tears fell. It was such a tender moment and one that I will always remember as a photographer. What a gift it is to be invited into such an intimate moment such as this. Congratulations to the new Mr. & Mrs.
Lara & Colin, what a joy it was to be able to be apart of your gorgeous spring wedding! You two are so good for one another and Luke and I wish you a lifetime of love and happiness! We are so grateful that you would have us capture your beautiful day and we hope you enjoy some of our favorites from your celebration! Thank you Colin and Lara and have an amazing honeymoon!